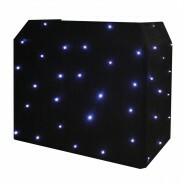 These starcloths are made from high quality, low reflective material and can quickly be mounted onto a goalpost or DJ stand using ..
Upgrade your Equinox DJ Booth with this black starcloth. Additionally you can create a white starcloth effect when combining the w.. Product Information Simply attach the Velcro loops and you have a great visual eff.. 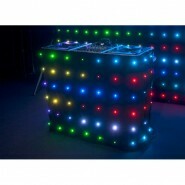 Product Information Now any mobile DJ or group can hang a professional looking cha.. 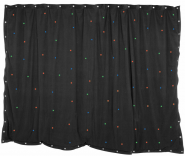 The MotionFaçade™ LED is the perfect companion to the MotionDrape™ LED. 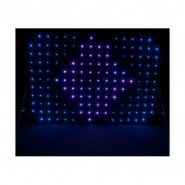 At 3.3ft-by-6.5ft, the MotionFaçade™ LED ma.. 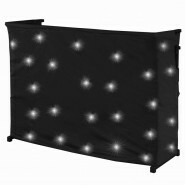 The MotionDrape™ LED is a backdrop for any mobile performer. 176 tri-color SMD LEDs matrixed across the 6.5ft-by-9.8ft b..